Guys, spring is here and I am so friggin' excited. Portland is in full bloom and it's absolutely beautiful over here. PLUS, we're past that awkward time between winter and spring where there was NOTHING was in season! In fact, my friends in San Francisco even reported seeing the first strawberries at their farmer's markets, so I know that in a few short weeks, my beloved Oregon berries will also finally arrive. Expect lots of berry pies topped with dollops of creme fraiche. Raise your hands if you've ever looked at the big, beautiful stalks of rhubarb in the supermarket, only to shy away because you had absolutely no idea how to prepare them? Just me? Because I'll be honest here —I've been intimidated by rhubarb for as long as I can remember. I had no idea how on earth to prepare them. What exactly was I supposed to do with those stalks? Is rhubarb the sort of thing you had to peel? Also, I'd heard that rhubarb leaves are poisonous. Is that even true, or a malicious rumor to scare away the amateurs? 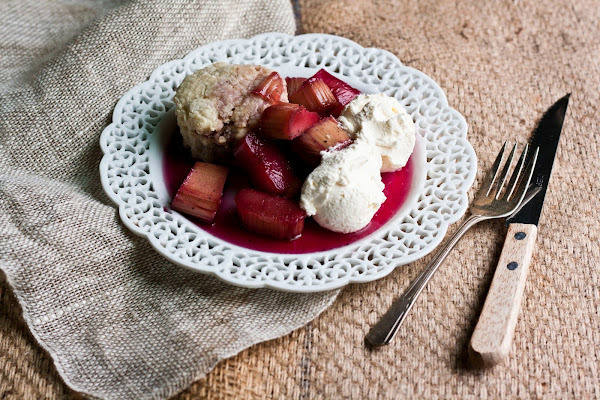 I could have just posted the recipe for roasted rhubarb right then and there since it was so amazing on its own, but I wanted to go the extra mile and make it special for several reasons. Long story short, I just wanted to try and cheer everybody up since I know that it's been a hard and distressing week for most. 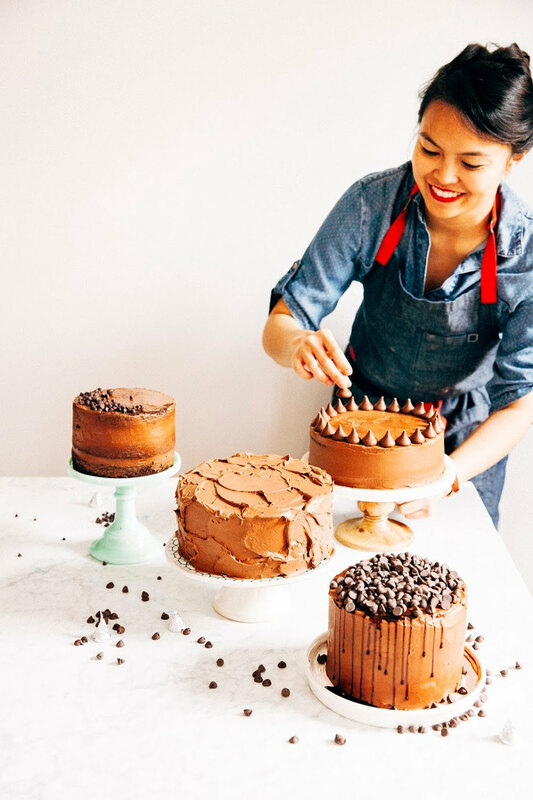 My goal was to create something delicious and comforting, allowing a little bit of escape from it all. I decided to pair the warm rhubarb with some sweet shortcake biscuits and vanilla chantilly cream, and, well... wow. Doing so really transformed this dessert into something else — something that succeeded in evoking the kind of simple comfort we could all really use right now. I know that sounds kinda corny, but sometimes, just sometimes, all you need is a warm, creamy dessert straight from the oven to help you get through the bad times. 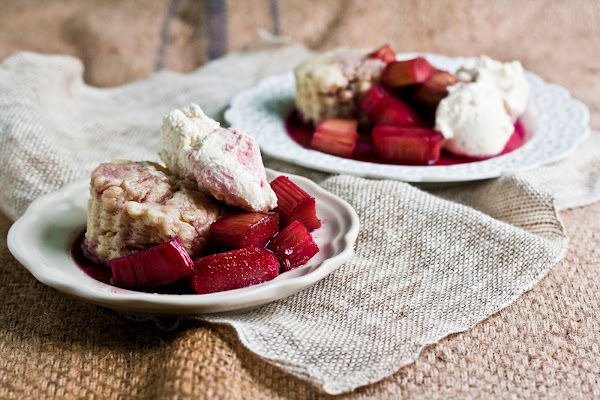 A couple notes — you can make either the rhubarb or shortcakes biscuits ahead of time. 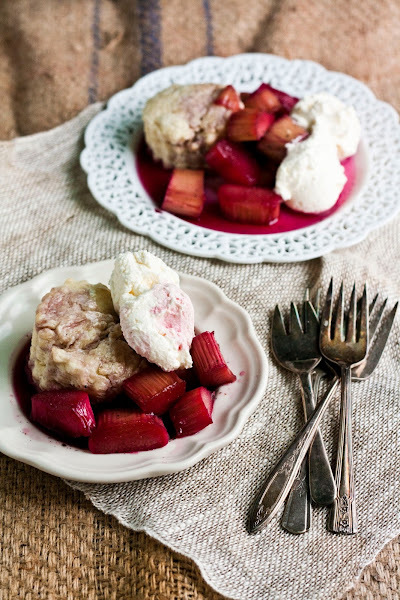 Rhubarb filling can be made 5 days ahead: let cool after roasting, then cover and chill. Reheat slightly before serving. Shortcake biscuits can be made 1 day ahead. Let cool completely and store airtight at room temperature. As for which one to make ahead of time, it really depends on which ingredient you want as the star. I ended up baking the biscuits first and then roasting the rhubarb to make sure it was fresh from the oven, but admittedly, it's much easier to reheat the rhubarb than it is to reheat the biscuits. In a large bowl, whisk together 2 1/3 cups flour, 1 tablespoon baking powder, and 1/2 teaspoon salt. Add 1/2 cup cubed unsalted butter and, use a pastry blender to blend into the flour mixture until the flour forms a crumb-like consistency with no large lumps of butter. Use a small glass to form a well in the center of the flour and butter mixture and pour in 3/4 cup plus 1/2 teaspoon milk. Use a wooden spoon to slowly mix the ingredients together, scooping the sides of the bowl over the milk in the center of the mixture until a dough forms. Be careful not to overmix the dough! Turn the dough out onto a lightly floured surface and fold it over itself a couple of times until it holds together — it'll seem like it's a little too crumbly at first, but have faith and just keep bringing it together. Pat out the dough unto a square that's about 1-inch thick. 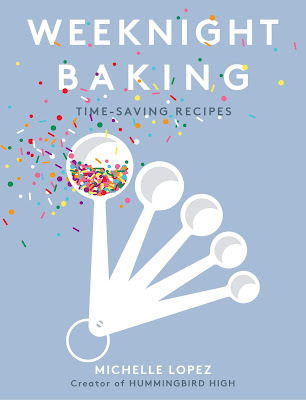 Use a 3-inch biscuit cutter to cut out 8 shortcakes — if using the offcuts, try not to overwork or overhandle the dough too much when reshaping. Place the 8 shortcakes on a baking pan and chill for 30 minutes, so that the dough holds it shape throughout the baking process. Preheat the oven to 350 (F). In a small bowl, whisk 1 egg and use a pastry brush to brush the tops of each shortcake with the whipped egg. Sprinkle each with 1 teaspoon (from the 3 tablespoons) granulated sugar. Bake for approximately 15 to 20 minutes, or until the shortcake biscuits have risen slightly and are a golden brown color. Let cool on a wire rack and make the rhubarb filling, leaving the oven on at 350 (F). Preheat the oven to 350 (F) — if you're making the filling immediately after baking the shortcakes, your oven should already be ready. Place 2 lbs rhubarb in a 9 x 13 inch baking pan. In a small bowl, whisk together 1 cup granulated sugar and 1/2 cup red wine — don't worry if it doesn't dissolve, it should just be a thick syrup. 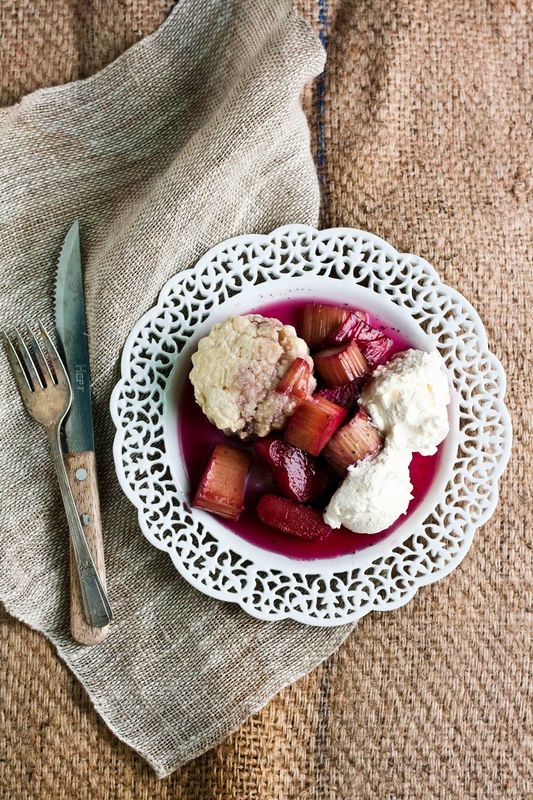 Drizzle over the rhubarb and toss to combine. Split 1 vanilla bean lengthwise and scrape in seeds from the vanilla bean over the rhubarb mixture. Toss to combine and add the vanilla bean pods. Roast until rhubarb is very tender and the juices are syrupy, around 30 - 40 minutes. Let cool on a wire rack and discard vanilla bean pods. While the rhubarb is cooling, making the vanilla chantilly cream. Shortly before serving, combine 1 1/2 cups cream and 2 tablespoons in the bowl of a stand mixer fitted with a whisk attachment. Whisk on medium speed until soft peaks form, about 2 to 3 minutes. In a small plate, combine 1 biscuit with rhubarb filling and vanilla chantilly cream. Serve warm. 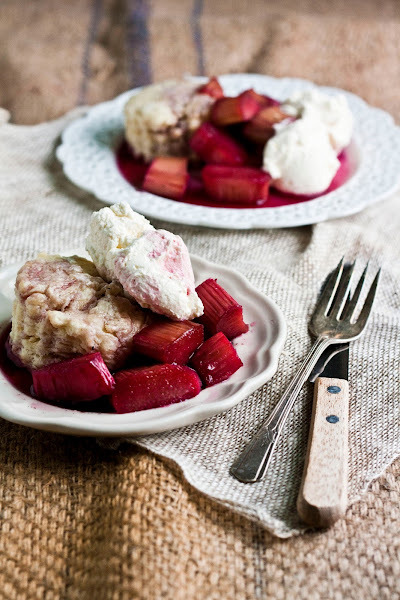 I love the idea of vanilla and rhubarb shortcakes, these look so delicious!